As medicine continues to evolve, western approaches to treatment seem to stray farther and farther from treating the root cause of disease and sickness. However, this is the exact purpose for functional medicine — to expose the true reasons for illness. For one of the main aspects of functional medicine, and of other natural theories alike, is to treat the whole body, rather than just the symptoms. This is because our bodies are composed of a complete system that works in perfect harmony with itself. Our bodies are not meant to be segregated in terms of treatment, but to be brought back to balance as a whole. This segregation, in conjunction with “surface-level” treatment, is what many believe to be the downfall of western medicine, and what has caused many to turn their back on modern medicine and to seek more natural, traditional treatments. Many of you may already be engrossed into the idea of “whole-body” healing, but may not have a full understanding of the details of functional medicine. Well, functional medicine is a philosophy – a profound practice that has a much more personalized approach to healing. For the philosophy behind this medicinal practice is that perhaps the root of sickness is held within the events of day to day life. This is because our health condition relies heavily on how we live our lives – what we surround ourselves with, what we do to stay busy, what working conditions we put ourselves in – and the list only continues. During a functional medicine consultation, there are a lot of questions involved. This is to better allow the doctors involved to understand what kind of conditions your body is in and how it reacts to certain events. This allows for strong ties to be made from behavior to the root causes of sickness; or, in this case, to infertility. You may be wondering how this whole thing ties into fertility and whether it is worth a try or not. Well, as previously said, functional medicine strives to bring your body into balance. Whether this balance be muscular, vitamin-related, or hormonal – they all have lasting effects on chances of conceiving. By understanding the root causes of your imbalances and by correcting them, the resulting outcome is that of a healthy reproductive system suited for getting pregnant and for carrying a baby to term. 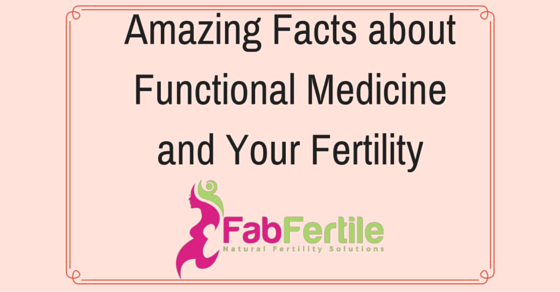 Additionally, functional medicine provides a sense of awareness to its users. It permits the patient to understand what is causing their specific conditions and allows them to do something about it. Often times, people go to the doctor, and only come home with a mere diagnosis, not a thorough report as to what you are doing in your life that is causing your ailment of infertility. And because of this “awareness” accompanying the use of this medicine, it is becoming less of an unfamiliarity. The practice of functional medicine is growing as it is continuously being integrated into western medicine. Additionally, more and more people are beginning to familiarize themselves with the power of functional medicine and what exactly it can do to improve their life. So what do you think? Would it be worth going to that first consultation? Book your FREE Supercharge Your Fertility Discovery Session here!